THIS WHEEL WORKS ON SPECIALLY DESIGNED 1/8 H. C 230 V , CAPACITOR STARTS VERTICAL ELECTRIC , MOTOR. A SPECIAL GEAR BOX IS DESIGNED TO REDUCE SPEED OF THIS WHEEL. THE INDUCTION HARDENED HELICAL GEARS MADE FROM SPECIAL ALLOY STEEL IS USED IN GEAR BOX. A SEPARATE ROTARY SWITCH IS PROVIDED TO GET THREE DIFFERENT SPEEDS SLOW (40 RPM) , MEDIUM (80 RPM) & HIGH (160 RPM) SPEED SUITABLE FOR POTTER FOR SHAPING SMALL AND BIG EARTHEN ARTICLES. THE VERICAL ELECTRIC MOTOR ATTACHED WITH GEAR BOX IS FITTED IN SQUARE SHEET METAL BOX & SS. TRY IS PROVIDED FOR EASY CLEANING. 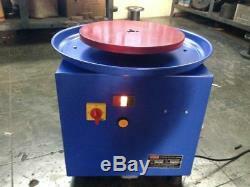 WORKING PLATE IS MADE FROM CAST IRON OF 12 DIAMETER ROUND IS FITTED AT THE TOP OF THE BOX. EASY TO HANDLE OVERALL SIZE W- 15 , B- 15 AND HEIGHT 16.5 , WEIGHT IS 55 KG. THIS WHEEL IS TECHNICALLY APPROVED BY. AND THE SHAPE OF HIGER END MODEL WILL BE SQUARE AND LOWER END WILL BE CYLINDRCAL. ANY ITEM WHICH IS OUT OF STOCK CAN BE MADE AVAILABLE ANYTIME. THAT MIGHT BE DUE TO SOME REASONS IT WILL BE DISPLAYED AS OUT OF STOCK. We are not liable to pay any Charges Outside India. All items are duly pack with bubble sheet / corrugated sheet and laminated envelope or corrugated box with lots of sponge stuffing to cushion the item securely to reach safely. Export Packing will be done. FEEL FREE TO ASK ANY QUERY. The item "Varying 3 speed potters wheel for professional ceramic work Heavy duty machine" is in sale since Tuesday, May 8, 2018. 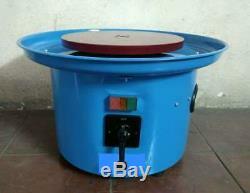 This item is in the category "Crafts\Sculpting, Molding & Ceramics\Ceramics & Pottery\Pottery Wheels". The seller is "triexp-0" and is located in Nagpur, MAHARASHTRA. This item can be shipped worldwide.